Hardscape features and amenities are great additions to any type of property. They will dramatically improve the aesthetic appeal of the outdoor area and make it more functional and safer. But property owners can enjoy these benefits only if the features are designed and built by an experienced hardscape contractor like us at Rob Rocks Inc.
Our company has been designing and building outstanding hardscape features for residential and commercial clients in Illinois. Most of our clients come from Bolingbrook, Naperville, Aurora, Plainfield, Yorkville, Lockport and Orland Park, IL. Majority of the outdoor amenities that we have built for them are patios, pool decks, retaining walls, and driveways. If you also need these types of features for your property, please call us at 630.742.4996. We can help you realize your dream outdoors by installing and building custom hardscapes in your property. Rob Rocks Inc is a trusted hardscape contractor in the state. We are duly licensed and insured, so clients are guaranteed of worry-free outdoor improvement projects. We are also one of the very few hardscaping companies in the state that can work on all kinds of hardscape features and amenities. From creating beautiful driveways to installing elegant patios, clients can always rely on our creativity and ability to build awesome outdoor features. As proofs of our expertise in this field, we can show new clients some of our completed projects in Bolingbrook, IL and surrounding areas. Composed of hardscape specialists. Our company is composed of hardscape specialists who can easily transform a dull outdoor area into an exciting outdoor environment. The hardscape features that they will create are based on clients’ needs and desires. Every hardscape is carefully designed by our creative team and only installed by certified masons and experienced crews. It is also our policy to keep ourselves abreast of the latest trends, methods, and hardscape products. This way, we can provide clients the best features and amenities. Decades of experience. One of the factors that every homeowner should consider is the length of experience of his or her chosen hardscape contractor. By hiring experienced ones like us at Rob Rock Inc, clients are guaranteed of outstanding results. The installation methods and techniques that we use are proven effective and according to industry-approved standards. Access to top-quality hardscape products. Our access to top-quality hardcape products and materials allows us to create beautiful and long-lasting hardscapes for our clients in Bolingbrook and other IL areas. We source them from reputable suppliers and manufacturers in the country, so they are proven durable. Since clients can choose from the wide range of available designs, they can easily find the perfect theme or design for their outdoor amenities. One of the reasons why we are popular in Bolingbrook and nearby cities is the affordability of our rates. We can also work based on our clients' set budget and still provide them the kind of hardscapes that they want for their properties. Some of the custom features that we can design and build include driveways, walkways, garden paths, patios, pool decks, sitting areas, retaining walls, pergolas, and other shade structures. 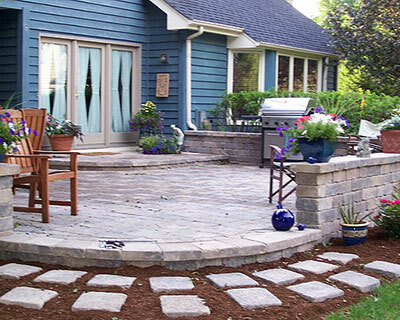 Get the services of Illinois’s leading hardscape contractor by calling 630-742-4996 today.